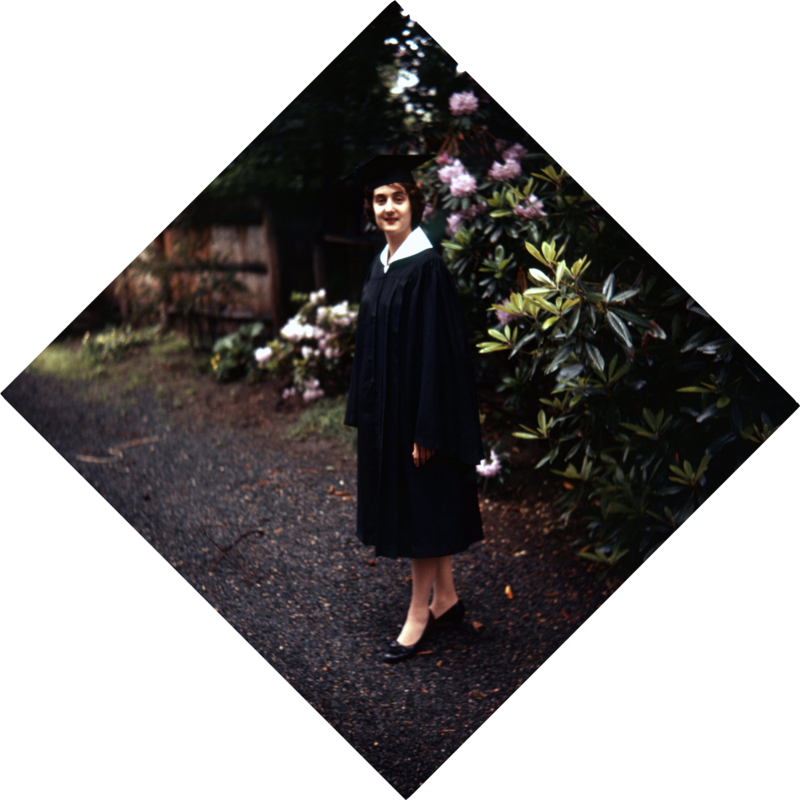 Sorry for the size of this 50-year old graduation photo; my laptop apparently doesn’t agree with wordpress. Ever since I left home photos are centered and large, no matter what I tell it. 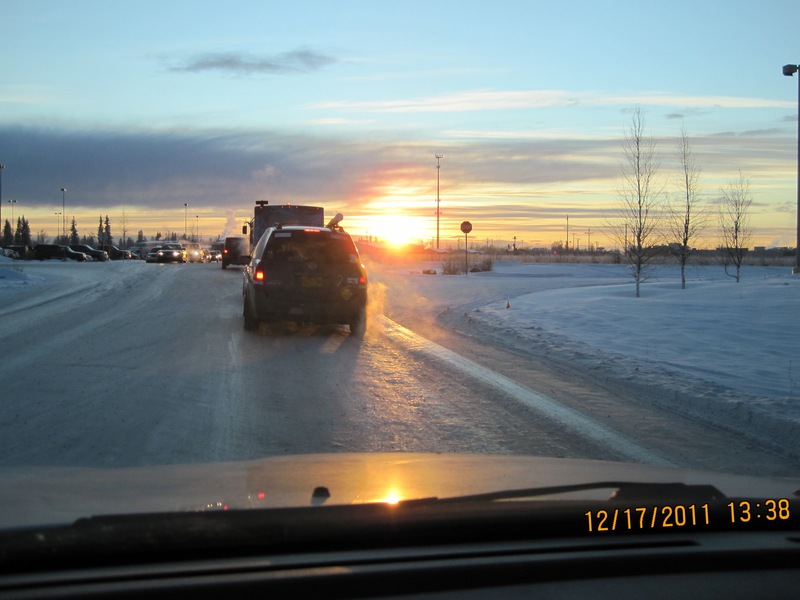 In Fairbanks the sun rose this morning at 3:46 and will set 20 hours and 6 minutes later at 11:52. The days are still getting longer, but not as fast; tomorrow will be only 6 hours 30 sec longer than today. Temperature? As of right now, 5 am Alaska time, it’s 48 °F but the forecast says 81°F for the high. Again, I’m not experiencing this. I’m in Boston (well, Cambridge) for my 50th Harvard reunion. Here it gets dark at night and I can enjoy the unusual combination of warm temperatures and dark skies. (Well, it’s supposed to be warm by the end of the week.) The day is only 14 hours 58 minutes long here. It’s warmed up, according to what’s on line–forecasts high73°F today, and it’s already (9 am local time) 54 °. That said, the skies are clear, I am hooked up to wifi, and as soon as I get some essential shopping done I’ll check on and answer comments from yesterday. Click the image to get the links to participating blogs. What point at the top of the atmosphere gets the most solar radiation on the day of the summer solstice? Would you believe the North Pole? Yes, that’s right. If the Earth’s pole of axial rotation were perpendicular to its orbital plane, the North Pole wouldn’t get any incoming radiation, and summer solstice would not even be defined. But with an axial tilt of only 23.5°, the pole still gets more radiation over 24 hours on the date of the summer solstice than any other point of the northern hemisphere on any date. Only the South Pole gets more, on the day of the winter solstice. But suppose the axial tilt were 90°? 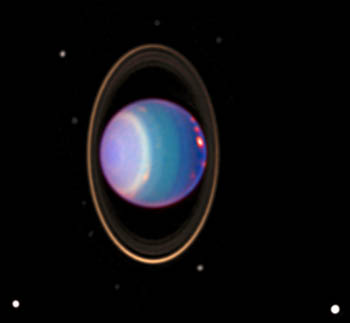 Uranus, as viewed by Hubble. We do have one planet in our Solar System that approaches this: Uranus, with a tilt of 82.14°. But let’s stick with the Earth and assume it has a tilt of 90°. What would the seasons be like? Summer solstice at the pole would be unbearable. Imagine the sun directly overhead at noon. Now stretch that noon out in time, so that the sun stays overhead for 24 hours. Hot? No place on Earth has that much incoming solar radiation today. Granted there would probably be clouds. In fact, there would probably be hurricane-like monsoonal storms unknown on our planet today. But it would still be hot. By contrast, the South Pole would be in the middle of a six-month long night. It would have some stored heat left from the intense summer, probably enough to keep maritime climates above freezing. But it would still be dark except for the stars, the moon, and the southern lights. The equator? At summer solstice, the equator would be pretty chilly. The sun would never rise or set, but just appear to sit at the northern horizon. As time moves toward the autumnal equinox, the sun gradually begins to rise in the north-northeast at 6 am, ride to its maximum height in the northern sky, and then set in the north-northwest at 6 pm. By the equinox, the sun would rise in the east, rise to directly overhead and then set in the west. But at the north pole, the sun has been spiraling gradually down the sky from overhead, until it finally just glides along the horizon at both poles on the day of the equinox, which begins a 6-month night for the North Pole and a 6-month day at the South Pole. What happens if you add up all of the incoming solar energy over the course of a year? Not too surprisingly, the poles are the winners, with the equatorial regions being relatively cool. Given that water is much better at storing heat than land, the oceans would be warmer at the poles than the equator. Land areas are far more likely to follow a strong annual cycle. High-latitude continental climates would have tremendous seasonal variation, while maritime climates would be much more uniform. Monsoons, which are driven by these land-sea differences, would be extreme. And equatorial climates, which on our earth are primarily wet or dry, would be intensely cold near the solstices and as warm as they get on the equinoxes. I haven’t actually tried this as a science fiction world—I want my planets to be habitable! But I do have a planet with zero axial tilt—Eversummer—in Tourist Trap. To quote Marna, the planet’s name must have been picked out by a publicity agent! 2nd Prize – a library of science fiction romance titles donated by various authors and an Anabanana Gift Card. Most of the books will be in digital format, with one print anthology. No more than one comment on a single blog will count, but you can comment on multiple blogs to improve your chances. Snowstake this morning. I've cropped it so the bottom of the stake is about at the bottom of the picture. The sun rose at 7:01 am and won’t set until 8:49 this evening, for a total of 13 hours 41 minutes of daylight. Astronomical night doesn’t start until after midnight, and by a week from now we won’t have astronomical night at all, as the sun will never get more than 18° below the horizon. By the middle of the month, when a performance of P.D.Q. Bach’s The Stoned Guest is scheduled, civil twilight will last almost an hour after sunset, and I should be able to drive myself there and home even though I can’t drive in the dark. It’s warming up, and it was actually into the forties for a couple of days last week. Snow has pretty well disappeared from fence rails and the top of the lattice. Water has been dripping from the roof, and I’ve actually seen a puddle or two. Temperatures this weekend have been a little cooler, staying slightly below freezing. But by next weekend they should be back into the forties, and breakup should start getting underway in earnest. This is the time of year I start getting really impatient—it’s usually clear and sunny, and I get eager for the snow, still almost 2’ deep, to go away! The road crews have pushed the berms way back on the main roads, and I’ve even seen a couple of short stretches of bicycle paths cleared, to the great annoyance of the snowmachiners who use them in the winter. I wish the snow would melt enough I could get to the shed and free my tricycle! I have been here two years today – or perhaps tomorrow, or yesterday. Solstice to solstice is 365 days, give or take a couple. With time, the uncertainly will become smaller. With time. I do not want more time here, I want to go home! I can almost see R’adel’, almost hear his voice. Jarn, what were you thinking? No proximity override, no sublight emergency beacon, scarcely any supplies? The answer is simple, if painful: I was not thinking. Oh, I can build an interstellar power plant, or could if I had the supplies. But without the resources of home? No, I am stuck here. Even if Songbird’s people come back, I can only watch them grow old and die while I live on, unaging, unchanging, with my remnants of civilization slowly decaying around me. Time. At least I am beginning to have a feel for how it runs on this planet. Equinoxes are not as easy to identify as solstices, but I think the time from southward equinox to northward equinox is about 170 days, while that from northward equinox to southward equinox is close to 195 days. Perihelion must be close to the southern solstice – which is an interesting bit of trivia, but not of any use except to set up a calendar. The days are close to their shortest – will be at their shortest, in another month – but still far longer than I can keep traveling, even in the crude sandals I’ve managed to make. I need to start exploring again, as I did before I first found the footprints of Songbird’s people. Who knows, perhaps I could find their Gathering? If nothing else, I can explore in the direction they went, and memorize teleportation coordinates that will take me closer to them, as well as those that will provide more food. Author’s note: I worked out the calendar for roughly 125,000 years ago from <http://www.thetropicalevents.com/>, assuming that the exact date of Jarn’s crash coincided with perihelion at the southern solstice. The eccentricity of the earth’s orbit was at that time quite a bit larger than today, thus the difference in length of the different seasons was also larger. By the way, I was interviewed Feb 8 on Christine Warner’s blog. Stop by and say hello! Every now and then I order a course on DVDs from The Great Courses. 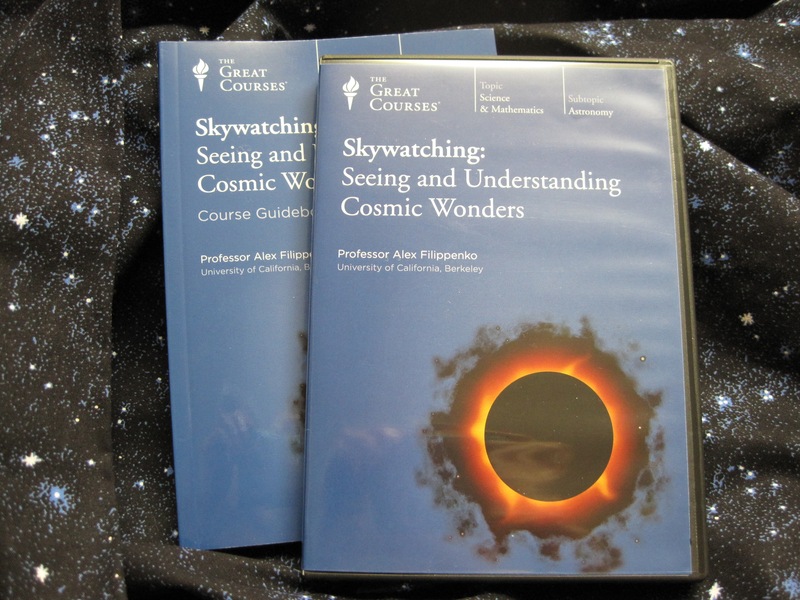 Most recently, I’ve been viewing Skywatching, a course by Alex Fippenkio on the sky, day and night: what can be seen in it and the physics of why it looks the way it does. Roughly the first third of the course deals with what we can see in the daytime sky. Dr. Filippenko discusses sky color in midday and when the sun is rising or setting, clouds, lightning, and the interaction of sunlight with water and ice (giving rainbows and halos.) This is closely related to what I researched and taught, so I didn’t really lean anything new. The presentation, however, was generally good. I did catch an error in one diagram, but I suspect that was the graphic designer. (The diagram is the one used to explain polarization in reflected light, and the error is that the angle of reflection and the angle of incidence are not shown as equal.) I was also rather disappointed that Dr Filippenko did not point out that frozen droplets are initially near-spherical, and develop their hexagonal prism shape (and the optical effects this produces) only later, by vapor-phase growth. But I suppose I shouldn’t expect everyone to be familiar with ice fog. This section of the course should be of particular interest to writers needing information on sky and cloud cover, storms, and less common phenomena such as rainbows or sundogs. If you are going to describe an evening sky, you’d better have some idea of what’s happening. Roughly half the course deals with the constellations and observing the bodies of the solar system. Most of this I was familiar with as an amateur, and I’ve used some of it — lunar phases and seasons, for instance — in my writing. Every writer who wants to put a moon in the sky should watch the section on lunar phases. Rising crescent moon in the evening? Nope. Just doesn’t happen. Neither does a narrow crescent high in the sky. The lecture on solar eclipses brought back the one I saw, shortly after I moved to Alaska in 1963. I didn’t have a car yet, but two other graduate students gave me a ride down to Sourdough, Alaska to see the total solar eclipse of July 20, 1963. There were scattered high clouds, and while they added suspense –would the sky be clear during totality? – they wound up adding to the experience. Every bright spot of Bailey’s Beads had its own rainbow (technically iridescence.) I know I took a picture; I remember taking photos both before and after the eclipse, the ones after being a series with the exposure set at a constant value to capture the change in the light. I found that series, but so far the ones before and during totality are missing. They may have been separate from the others and lost during the fire twelve years ago. Overall I’d give the course an A. Dr. Filippenko is a wonderful teacher, and with few exceptions the graphics are excellent. The course takes 3 DVDs and consists of 12 45-minute lectures. Above freezing yesterday – and that’s not a good thing this time of year. The ground is cold, and water freezes out of the air as frost, making things very slippery. As far as I’m concerned, warm weather can wait for March or April, when there’s some chance things will stay warm and the snow will actually melt. Right now, with the winter solstice only two days away, it just means more ice. Waiting for a left turn, looking south near solar noon. Yes, that's ice on the road. Sunrise this morning will be at 10:57, and the sun will set at 2:39. Not much time to fit a little shopping around my doctor’s appointment, as we have only 3 hr 42 minutes of daylight, with the sun getting no more than 4 times its own diameter above the horizon. Sunrise, sunset and length of day are changing by only seconds a day, now, and by Thursday the days will be getting longer again. The winter solstice is definitely time for celebration as things turn around! The forecast is for slightly above normal temperatures for the next week, but not much snow. Too bad, as we could use more snow. I haven’t been bothering to photograph the snow stake, as it seems stuck on 9”. I did, however, get a couple of photos Saturday: one of the pink and blue of the trees this time of year, and another of driving conditions. This is an excerpt from the (fictional) journal of a human-like alien stranded on Earth, in southern Africa, roughly 125,000 years ago. His journal will eventually become the Holy Book of many planets in the Jarnian Confederation, which is where my two science fiction novels, Homecoming and Tourist Trap, are set. The parts of the journal that have been blogged to date are on my author website. The northern solstice has passed! I have made a calendar of sorts, with Songbird’s aid. There is a particular flat rock I stand on, at the top of the rise where I have built my shelter. I can see the sunset move around the horizon from that point, and though the horizon is not flat, the hills are constant. Songbird goes out with me at sunset every day, and moves until the stake she holds is just lined up with the sun on the horizon. Then she drives it into the ground. If it will not go in (which sometimes happens) she holds it while I pile loose rocks around it. The last few days the stakes have been almost in the same place, but this evening the position of the stake was definitely south of yesterday’s stake, if by only a fingerwidth. I think the actual solstice was two days ago. At any rate that is what I will assume in figuring the year length, and in trying to estimate when the rains — and Songbird’s people – will be back. Songbird was not very enthusiastic about helping me at first, though she was obedient enough to do as I said. More of this “god” stuff, I suppose. But when I explained that I wanted to use the sticks to help me know when to go look for her people’s return, she rapidly started reminding me when it was almost sunset. Her leg has healed without a trace of a limp, and I must admit that I feel rather proud of my skills as a doctor! Of course I have not been here long enough yet to know exactly when the rains will start and the game and Songbird’s people will return. But both should occur as the sun’s course moves back south. I want to see that shaman! And then everywhere and nowhere became our center. Make up a different music of the spheres. Beats slowly by the beating of our hearts. Season to season, the cycles of the sun. Here we are centered once again. What’s this about? There is a room at the UAF museum in which the rhythms of the earth — seismic tremors, sun, stars, aurorae — are expressed as musical tones and colors on the wall. This poem was inspired by that room. The waxing moon is shining in my window at night, now, but it is lower on the horizon every day. I don’t mean it’s later when I go to bed; I mean that the moon follows a lower arc in the sky every night, even as it becomes fuller. What’s going on? Waxing gibbous moon, looking south before sunset April 14. I’ve done a good deal of talking about the sun being lower each day in the sky until the winter solstice. Since then the sun has been higher in the sky each day, though it’s still only 35 degrees above the horizon at noon, and will never go above 48.6 degrees here at 64 degrees 50 minutes north. But what about the moon? The moon goes around the earth approximately in the same plane the earth goes around the sun. (We’ll get to the “approximately” later.) That means that when the moon is full, it is opposite the sun in the sky. If the sun is way below the horizon at solar midnight, as it is around the winter solstice, the full moon will be high in the sky. In fact, it will follow nearly the same path on the winter solstice as the sun follows on the summer solstice. On the summer solstice, the full moon will barely peek above the southern horizon. The new moon, on the other hand, is in nearly the same place in the sky as the sun. The new moon will follow approximately the same path as the sun. The new moon will be very low in the sky in winter, and very high in the summer. What about other phases? Right now the moon is waxing gibbous — that is, it is between first quarter (when it looks like a half circle in the sky) and full. On April 14 its highest altitude was 26.5 degrees; tomorrow it will be 20.3 degrees. Effectively, it is following the same path as the sun did in mid-March. I won’t even try to go through the mathematics and geometry involved, but for practical purposes the waxing moon is highest in spring, with the first quarter being highest near the vernal equinox (northward equinox, on the Confederation calendar) and the third quarter being lowest. In fall, this is reversed, with the waning moon being higher in the sky. Up until now, we’ve been assuming that the moon’s orbit is in the same plane as the Earth’s. If that were really true, we’d have two eclipses — one lunar and one solar –each month. In fact, the moon’s orbit is slightly inclined to the ecliptic — about 5 degrees, to be exact. The direction of the inclination changes due to the pull of the earth’s equatorial bulge, which causes the plane of the orbit to precess with a period of 18.6 years. The inclination of the orbit makes the moon appear to move slightly above the sun’s path in the sky for half a lunar cycle, and slightly below it for the other half. Which part of the cycle depends on time of year and where the moon is in its precession cycle, but it is possible for the moon to be circumpolar or to remain entirely below the horizon here in the Fairbanks area, even though we are south of the Arctic Circle. Right now, eclipses are near the solstices, so we won’t see the full moon stay below the horizon all night in summer, or be above the horizon at solar noon in the winter — though I’ve seen it in other years. No, it’s not about the books. But yesterday I mentioned that we no longer have astronomical night, and I felt that some definitions were in order. End of civil twilight, available light photo looking NNW at 10:10 pm last night. Twilight is defined as the period between the first traces of scattered light in the sky and sunrise, and between sunset and total darkness (other than starlight and moonlight.) It is actually divided into three periods each in the morning and evening, with boundaries determined by how far the sun is below the horizon. Civil twilight is the period between the sun being on the horizon (sunrise and sunset) and the sun being 6 degrees below the horizon. If the sky is clear and you have good vision, you can generally see well enough to drive without lights, though your car will certainly be more visible to others if you turn your headlights on. The brightest stars and planets become visible after sunset and fade out before sunrise during civil twilight, but it’s not a very good time for even casual astronomy, except for watching the new moon, Venus and Mercury. Local laws generally define the limit of civil twilight using the time (30 minutes before sunrise and after sunset, for instance) but that can be very far off at high latitudes. 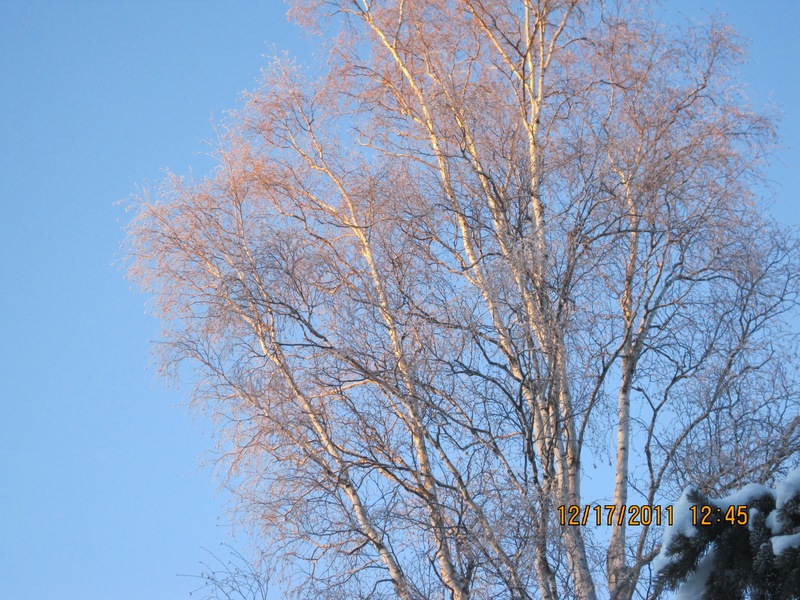 Here in Fairbanks, for instance, it never gets darker than civil twilight from May 27 to July 28. Nautical twilight is the period when the sun is 6 degrees to 12 degrees below the horizon. It was originally defined as the time when it was possible for sailors to make star sights, as most of the stars were visible but so was the horizon at sea. 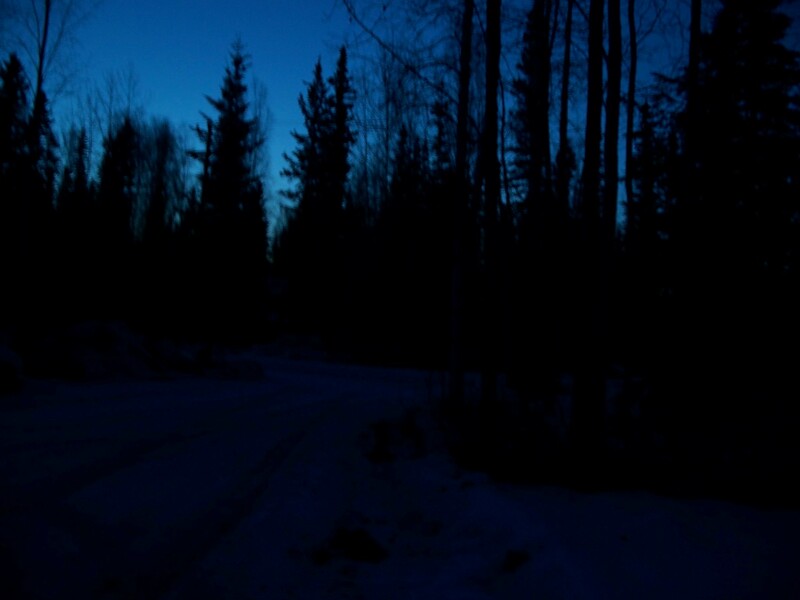 Here in Fairbanks it never gets darker than nautical twilight from April 26 (two weeks from now!) to August 18. Astronomical twilight is defined as the period when the sun is 12 degrees to 18 degrees below the horizon. Ideally, when the sun is more than 18 degrees below the horizon 6th magnitude stars should be visible. Sadly, this is no longer true anywhere in the vicinity of city lights, and in most places the difference between astronomical twilight and civil twilight is imperceptible. 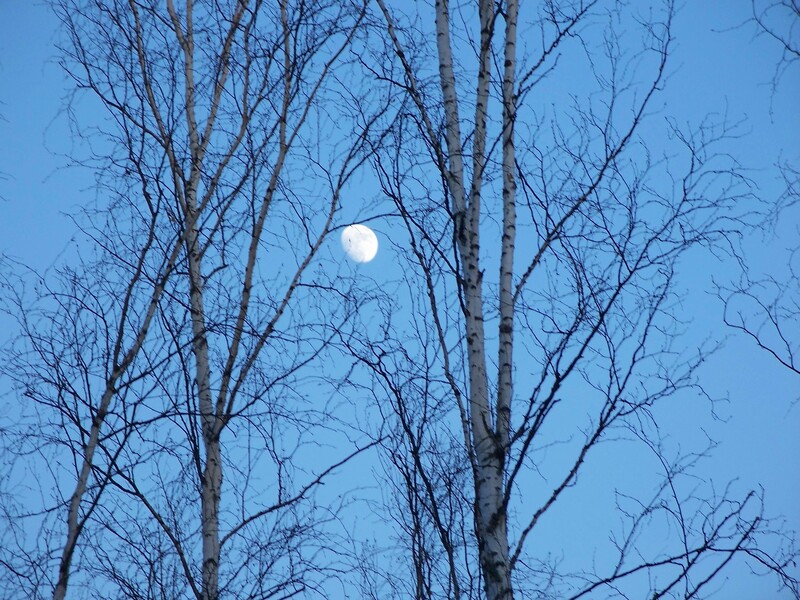 Here in Fairbanks, it does not get darker than astronomical twilight from April 9 to September 4. City lights are not a great problem up here, but aside from a brief period in September good astronomical viewing coincides with temperatures far too low for comfortable star gazing. Twilight is very short at the equator, where the sun sinks or rises vertically at a rate of 15 degrees an hour . This gives only 24 minutes for each stage of twilight. Sunsets and sunrises seem very abrupt. At higher latitudes the sun seems to slant down to (or up from) the horizon, and twilight (and sunrise and sunset colors) can last much longer. I’ve tried to incorporate this in Homecoming — the sunsets and sunrises are very short on Marna’s tropical island, for instance. Tourist Trap: Reader Views Fiction Book of the Year!